High risk high reward options don’t come around too often in Pokemon, but sometimes they’re extremely interesting if only for the purpose of analyzing how you can break one of them. 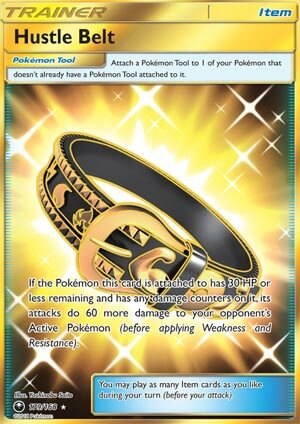 Hustle Belt is an Item that lets you do 60 more damage to your opponent’s Active Pokemon if your Pokemon equipped with this has 30 HP or less when it’s attacking. Not a lot of Pokemon will hit that 30 HP or less on their own – most of the time, 2HKOs keep that idea well beyond the realm of possibility. However, there are some Pokemon with scores of 30 HP or less by default…most of them from long before Hustle Belt was invented. Nowadays, there are only a handful of Pokemon like Magikarp, Feebas, and Wishiwashi that will have 30 HP or less printed on them, but that does give a significant power boost to their attacks. Taking Wishiwashi as an example, he’s got two cards that have a Water Gun move, which will do upwards of 70-80 damage thanks to the boost from Hustle Belt for 1 Energy. That’s immediately better than what they could ever accomplish on their own, but it does come at the likely cost of losing that Pokemon on the next turn. In Expanded, there’s one deck that is always looking for more ways to power up its strongest yet smallest attacker in Night March, and adding on an extra 60 damage to anything in that deck is just asking for trouble. Needless to say, Hustle Belt has a fairly niche place, but for most decks, that niche is too much for them. As for the remainder, they’ll benefit from it heavily. Arora Notealus: Like any card of this magnitude, you have to take it at more than face value. While there aren’t a lot of immediate applications for it, there are enough Pokemon in the game that can make it work that it warrants some testing. There will be better targets than others, but that’s where the experimentation helps the most! Next Time: The most spooktacular group of Pokemon celebrates Hallow’s Eve! Today, we’re looking at Hustle Band (SM Celestial Storm 134/168, 179/168). This is a Pokemon Tool with built in requirements in order to finally reap the effect. This tool can be attached to any Pokemon, but it only works if the holder has 30 or less HP remaining as well as being damaged – meaning it has to have damage counters on it. After those requirements are met, then you get to enjoy dealing 60 more damage to the Defending Pokémon (before applying Weakness and Resistance). This is not a easy tool to use. With those requirements, you are more likely benefit from this effect only once at best because your opponent will finish you off with a soft attack, in addition to any other effects that’ll disrupt you. It is not a good idea to bank on your opponent to fall short of a KO, and even if you do, even at 30 HP, residual damage – that can potentially stack – such as Poison, Burn, and even Shrine of Punishment will likely spell doom in this range, ruining any hopes to try to get that effect. And there’s the usual tool removal like Field Blower as an extra measure for those who truly know that they will fall short of a KO. With that idea out of the window, we must think of other alternatives, ideally on the same turn that you play this card. Rainbow Energy can easily put a damage counter on it, fulfilling one of the requirements, but trying to get it with 30 HP or less is a bit tricky. I can think of very few Pokémon that might take advantage of it. Natu (SM Lost Thunder 87/214) has the Lost March attack that costs CC. This Pokémon might be able to attack right away with a Rainbow Energy – damaging itself, leaving it at 30 HP – and Dimension Valley – reducing the attack cost by a Colorless Energy for Psychic Pokemon. Joltik (XY Phantom Forces 26/119) would’ve been prefect as it has 30 HP, but it is not damaged, so it can’t reap the effect. You can use Rainbow Energy to damage it, but you still can’t meet the CC cost of Night March. That’s what I can come up with in terms of who benefits the most from this tool. Hustle Belt isn’t for everyone. Decks that can accommodate both requirements will make great use for this card as it provides a sizable boost. Even if Choice Band leaves Standard – haven’t seen any reprints of this card – Hustle Belt is NOT the second best thing even for being a damage boosting card. Might as well equip something defensive or tactical in Standard. Limited format might see use for this card, as the times where you finally get its HP down to 30 or below, the damage output becomes amazing for whatever Pokémon you’re using. As it is the case, you are more likely to benefit from this once, as the next turn, the Hustle Belt user will be finished off by a small attack. Hustle Belt (CES 134) made its debut in the Celestial Storm expansion set. This card boosts your active Pokemon’s damage to your opponent’s active by sixty points if your active Pokemon has 30 HP or less remaining AND it has any damage counters on it. Yeah we all were laughing at this card… until we ran into that really annoying Goomy deck. Ugh that thing was pretty annoying, I’m glad that phase seems to be over on PTCGO. In case you missed the Goomy / Hustle Belt 15 minutes of fame (infamy), if you put a Rainbow energy on Goomy (FLI 91) and attach Hustle Belt, you’ll get a little bit of a glimpse at what some people think Shuckle GX might become. Goomy FLI 91 has an ability Sticky Membrane that makes your opponent’s attacks cost one Colorless energy more. Yes, that means you would need six energy to attack with the Celesteela CES card that we reviewed last week. Meanwhile, Goomy would sit there laughing at you while you scrambled to find another energy for Zoroark GX, while digging for E Hammers and Plumeria and chipping away at you for 70 damage a turn (plus whatever Shrine was compiling on you as well). Of course, then I came across one when I was playing Greninja GX… and I haven’t seen Goomy since. Hustle Belt either for that matter. Not to give the Lost Marchers any ideas, but it could be played in that deck. Put a Rainbow Energy on Natu and you’re hitting for an additional sixty damage… but you’re probably better off just running regular Grass energy and adding another couple of Lost Mixers. I’m sure you probably guessed, but none of the top finishing decklists played this card at any major tournament so far season. Hustle Belt (SM – Celestial Storm 134/168; 179/168) is a Pokémon Tool that has no extra attachment restrictions beyond the usual “Can’t have multiple Tools attached to one Pokémon.” rule that applies to most (but not all) cards. It doesn’t actually do anything, though, unless the Pokémon in question has 10, 20, or 30 HP remaining *and* has at least one damage counter on it. This results in the equipped Pokémon doing an extra 60 damage. That is twice the bonus afforded by Choice Band, and applying to everything and not just Pokémon-EX/GX… or for those who are familiar with Expanded, it is a triple Muscle Band! The issue stems from actually pulling this off. The good news is that, as an offensively minded Tool, you can try to keep to only equip it right before you can take advantage of it. The bad news is, besides extenuating circumstances (say, using a Professor Sycamore) forcing you to attach it prematurely, getting down to 30 or less HP without going too far and getting KO’d is difficult to manage. Your opponent might accidentally help you out by nearly KOing something, but more of the time you’re going to need a means to sufficiently damage one of your own attackers… and whatever the combo involved is, either it needs to protect your injured attacker or the boost had better be worth an all but guaranteed retaliatory KO on the following turn. There are ways to set up for Hustle Belt usage, but they aren’t practical at the moment. You can take something of any size and simply hope your opponent leaves it with 10 to 30 HP remaining and… that is actually your best option right now. You may even be fortunate in that your opponent uses Field Blower or the like to discard a Tool you were already using, freeing the survivor to go for broke with Hustle Belt. This being the best option is NOT a sign that the card is worth it! The next option is finding a way to lightly damage smaller attackers. You cannot just slap a Hustle Belt on Joltik (XY – Phantom Forces 26/119); even though its max HP is 30 it still needs at least one damage counter on it. You could use something like Rainbow Energy or Team Magma’s Secret Base to place one or two damage counters, respectively, on Joltik, though this specific Pokémon needs [CC] to use its infamous “Night March” attack, and Night March decks usually need Dimension Valley to lower the attack cost on Pumpkaboo (XY – Phantom Forces 44/119) from [CCC] to [CC], so Team Magma’s Secret Base won’t work too well for that. Plus, this trick ONLY works for Joltik; Pumpkaboo would need BOTH Rainbow Energy and Team Magma’s Secret Base to lower its 60 HP to 30 HP, where Hustle Belt could kick in… and then you need another [CC] worth of Energy to actually use Night March. A third approach is to take a card like Reuniclus (Black & White 57/114; BW – Dragons Exalted 126/124) plus something difficult for your opponent’s to OHKO (but not immune to damage) and let it get hurt, move the damage counters to whatever attacker you want to hulk-up with Hustle Band, Retreat or Switch into said attacker, and go to town. Notice how this combo involves relying on the Ability of a Stage 2 Pokémon with 90HP, only legal in the Expanded Format, plus something that can resist being OHKO’d. All of these are possible, just unlikely to work. There are a few upcoming cards that maybe, just maybe could make good use of Hustle Belt, the most likely being a Donphan we are likely to get in SM – Lost Thunder, possessing an Ability that prevents it from being OHKOed if its HP is full. Yeah, THAT is the one which is most likely. Digging through some more obscure cards, especially in the Expanded Format, you’ll find stuff like Shedinja (XY – Roaring Skies 11/108) and/or Damage Mover, but these are things to pursue for the fun of playing them, not for a winning deck. Enjoy Hustle Band in the Limited Format, where you almost certainly won’t have another Tool to use instead of it, and where your opponent is likely to need more than one attack to score a OHKO. I didn’t expect to go on this long about Hustle Band. I didn’t speak much of using it in the present Standard Format; I know there are a few “joke” decks that have used it, but Goomy (SM – Forbidden Light 91/131) only works against the unlucky or the unprepared. I probably should come straight out and say it; stick with the proven Tools of Expanded, especially in light of the anti-Item and anti-Tool effects that already punish so many better cards. Just enjoy it for the Limited Format (if you have the opportunity), in casual play, and maybe – just maybe – in the future.